“‘We will not open the door,’ they cried. ‘You are not our mother! We’re goin’ Grimm today, you all. Back in September, Minedition (whose books I’m always eager to see) released a picture book adaptation of the Grimms’ tale “The Wolf and the Seven Young Kids” with illustrations from Keiko Kaichi. The Wolf & the Seven Kids was translated by Anthea Bell and is very faithful to the Grimms’ version, viciousness and all. And this is the debut book from Kaichi, who was born and raised in Japan and who currently lives in Osaka. Kaichi’s kids, the baby goats, are clearly snuggly and … well, flat-out adorable, as you can see here. But the book doesn’t shy from the original tale’s dramatic turn-of-events. The wolf still eats every kid but one, and the mama still releases the six from the wolf’s stomach with her scissors, needle, and thread. Oh, and that’s right: The big bad wolf also still sees his demise at the bottom of a well. This has always been one of the most terrifying Grimms’ tales to me. An intruder bursts into the home and kidnaps, then devours, each and every kid — but one. The one who manages to hide and hear the entire thing. Oof. This makes it all the more satisfying when the mama comes home to save everyone. With her SEWING KIT, nonetheless! And then she distributes very tight hugs. Kaichi’s color palette is particularly soothing, but I’ll let you see for yourself with some more art below. a soft voice called, ‘Dear mother, I am in the grandfather clock.’ She took the kid out, and he told her that the wolf had come and had eaten all the others. THE WOLF & THE SEVEN KIDS. Illustrations copyright © 2014 by Keiko Kaichi. English text translation by Anthea Bell. Illustrations reproduced by permission of the publisher, Minedition, Hong Kong. 1) Visiting a brand-new, beautiful library. 3) Friends who feed you delicious meals. 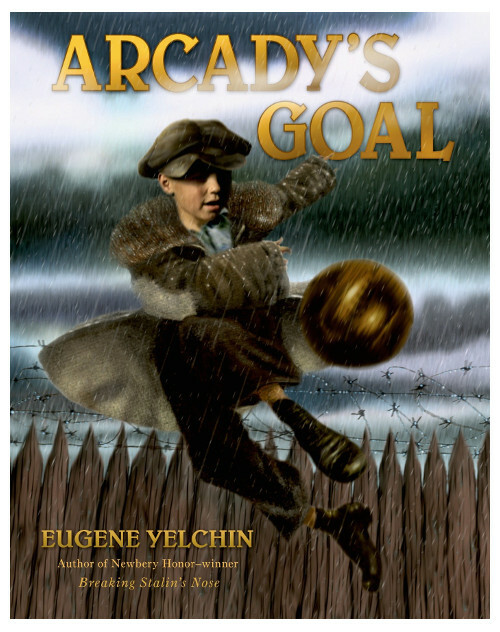 4) My latest book club read, Eugene Yelchin’s Arcady’s Goal, is so good. 6) Re-reading beloved novels with my girls. 7) Kick in advance: I’ll see some old friends this week. I have not got my act together to visit 7 imp recently. And I have missed you all so will be back to read more lists tomorrow! The art today looks scary but also lovely. And your list is great too, Jules – books, friends, reading with your girls…wonderful things! I have never heard of Arcady’s Goal so thanks for the rec. 1. One of things I wasn’t on 7 imp for was our 2 week road trip through New South Wales (state to the south of us). It was a great mixture of landscapes (outback to snow to beaches) and the capital Canberra. 2. Beautiful afternoon last weekend with three little cousins having a ball on the slip and slide (water play thing) in the backyard. Love watching them play together. 3. Loving the small children’s play space at our local library as Rowan can crawl around chasing images on the interactive mat and pulling out books while I pick out books to take home (and sit and rest too if I’m honest!). So much nicer than having to keep him in the carrier or pram all the time. 4. Bought my first mango, nectarines, peaches and grapes of the season. Summer has begun! 7. A relaxed afternoon in pleasant company celebrating friends’ baby’s one year old birthday. This is one of my favorite Grimm stories. T reminde me of Hegedy Peg. I love Keiko’s illustrations, evoke a certain fear of being eaten. Jules, I bet the new library is gorgeous, it seems like you’ve had a friend filled week. Emmaco, so glad to hear from you. We’re heading into winter and you’re enjoying the fruits are summer. Rowan and Libraires, wonderful. 1. Generosity. It’s book fair time and the events with dads and grandparents have gone well. Today I pick up muffins from a local church for the muffins and moms event tomorrow. 4. Planning a surprise for oldest grandgirl’s birthday. 5. Kind words from a friend. 7. Good things in the mail. Jules- A brand new library. That must have been so super fun!! Emmaco- I visited this great spot last week for the first time in ages. Isn’t it good to be back?! And so jealous that you are headed into summer. The air is feeling like winter here! Jone- Oh… Good things in the mail are the best! 1. Bellweather Rhapsody. I was looking for a new grown up book to read and a friend recommended this and it was great. 2. Warmer than usual fall days. 3. Homemade scones. A bit burned but still tasty. 4. My oldest is reading the Outsiders. What great memories! 5. I am reading Dory Fantasmagory with my youngest. Such a fun new book! Fly by posting — On the way to the theatre! Happy Sunday to all of the Imps and all of your kids, goats and humans alike. This is one of my favorite Grimm stories; frightening but the Mom saves the day with her cleverness and courage. It reminds me of Heckedy Peg too Jone. The artwork is simply lovely; misty and magical like the land of fairy. Jules: Reading with your girls is the best. And there is nothing quite like a new library. Plus I have to say your blog and writing at Kirkus are a constant blessing to the world of children’s literature and a wonderful resource. Emmaco: Happy Summer to you! Sunflowers on a table do so much to brighten a room. Jone: I hope you will share the birthday surprise with us if you can. Stacey: Reading The Outsiders is something you never forget. Glad you got the comfy new boots. Willow: Hope you had fun at the theatre! This book looks lovely. I want to pet the kids, they look so soft. Jules – Friends who feed you well (or at all) are wonderful friends indeed. emmaco – Sounds like you’ve had a lovely time. Jone – Friends who speak kind words are also wonderful. Stacey – I loved “The Outsiders”! LW – Bravery, so important in the creative fields. It’s been a while since I’ve had a Sunday moment to sit and post here. 1. Book Club 10th anniversary celebration was much fun. I’m so happy to have these ladies in my life. 3. Trying out a new schedule so that I can get more rest and be more productive. This is tough for a night owl like me. 4. Getting the kids to help more around the house. 7. My baby girl is officially a teenager. Happy Summer, Emmaco. You’ve been living well. Will you remind me again how old Rowan is now? Jone, love your first kick, in particular — and happy birthday to your granddaughter! Stacey, I love Dory so much. And I’m going to have to check out the adult one you read, ’cause I need some good recommendations in that category. Little Willow: Sparkles. Because. I like them. I hope you had fun with theatre today. I think you always do. Margie: Oh! Thanks for the kind words! And will you tell us about the mock Caldecott results later? I love hearing about those — with students. Moira: TEENAGER? Already? Really? Wow. Also, I’d love to hear your tips on rest, if you don’t mind sharing, because I am a hopeless night owl too. Those Grimm tales are so frightening but we love them as we cuddle together and feel the warmth of each other, safe and sound and not in the book. This rendition is a love. Stacey thanks for the book rec! Sounds like a fun read. Margie, you have snow already! wow!